You've read the story of Iqbal Masih and watched videos that examine his life. He is a person who showed everyone around the world that slavery still exists today - and it reveals itself in the form of child labour. How could the story about Iqbal cause people to take action and do something? What kind of action do you think could be taken? Child Labour Monologue Assignment - Time to get creative with your writing!! Now it's your turn.... You are going to find an image of a child labourer from one of the websites below (or scroll to the bottom of this blog), and brainstorm key ideas for a key message that the child in the photo might give in a 30 second - 1 minute monologue (this is about 3/4 - 1 page double spaced typed writing). But wait! Before you can write your monologue, you need to get informed!! *** CHILD LABOUR ASSIGNMENT - Click on the link to access the Google Doc, "Two Column Graphic Organizer"
Here is a selection of pre-selected websites on child labour for you to evaluate and perhaps use for your research on life of child labourers from around the world. Some sites are better than others, and most are from well known International and National organizations on child labour. Read through at least 6-8 of the sites. Scan text features such as graphs, pictures, multi-media (slideshows, videos and podcasts) and get a sense of the issue. Then choose 1 or 2 and complete a Two Column Graphic Organizer for research for your Child Labour Monologue Assignment. ILO's Slideshow - "Dreaming of Freedom"
Globe and Mail - "Is there less child labour?" What is a monologue? It is a speech given by one person directly to an audience. It is personal and expresses a person's thoughts, feelings and personality. When brainstorming... What other supporting details would you use to support the main message? Use the paragraph diagram (see your notes) to organize your ideas and write a draft. After drafting, you will then share your draft with another student PAIR. 1) Who is your monologue about? 2) What do they do as a labourer? 4) What is your hope? What are your dreams? Revise your draft based on the feedback receive. Finally, edit your draft for mechanical errors... and write a good copy. You will be adding a copy of your Child Labour Monologue on Kidblog.org - You will also be presenting your monologue for the class. If you are willing to try, you could record yourself with www.vocaroo.com or blabberize http://blabberize.com and then embed the recording into your blog on kidblog.org. You are going to create a slogan that will motivate people to take action against child labour. The primary purpose is to create awareness of this global problem. This button must be attention getting... therefore it must be coloured in pencil crayon. Letter or writing must not only be neat, but be attention grabbing, so either outline your words in black marker or type them! The diameter of the button must be at least 10 -12 cm's - yes this will be a big button. (Diameter is the distance across a circle through the middle, from edge to edge). Go to www.taggalaxy.com and check out images on child labour via Flickr. There may be an image which might inspire you. To cite the source, just source: www.taggalaxy.com. How did you start your monologue? 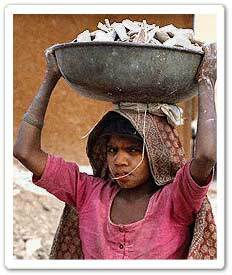 "My name is ____ and I am a child labourer..." What are some other ways you can start? What are some ways that you can "hook" you audience with an engaging lead? Read the information below on interesting leads in writing... Note that the information is about Expository Writing, but how can you apply this to your narrative piece? What's the most boring way you could begin a research report about the human brain? A rattlesnake? The United States Constitution? We all know.
. . . In the report I will tell you about. . . "
Now that we know that, let's experiment with difference places to start. • Start with a Snapshot. When you paint a picture, you draw the reader in . Notice the difference between these two leads to a report about ice-skating. Ice-skating is my favorite sport. black ice, moving toward the city. The only sound is the scraping of each blade as it bites into the river. That's me doing my favorite sport, ice-skating. • Start with an important observation. Don't start in the general. Put your most surprising or important observation into you opening. The human brain is a complex and amazing organ. question is one we all want to know the answer to. In this paper I will attempt to answer the question why history is important. What's the point of studying history? Who cares what happened long ago? After all, aren't the people in history books dead? subject? What specific memories of the subject come to mind? The problem of longitude was one of the greatest scientific challenges of its day. • Flaunt your favorite bit of research in the lead. Start with the facts that made you smile, laugh, go "ahaaa" or just plain grossed you out. Did you ever wonder why God created flies?